A British corporation named Fibrowatt Ltd. has built three poultry waste incinerators in the UK (later sold to Energy Power Resources Ltd.). They later set up shop in the U.S. with plans to build many more. Their first U.S. target was Benson, Minnesota, where they built the largest "biomass" incinerator in the country - a 50 Megawatt plant that burns 500,000 tons of turkey litter a year, plus 100,000-200,000 tons a crops and/or agricultural wastes. Before the plant was even built, they sold off ownership of the Fibrominn plant to a New York City hedge fund, ContourGlobal's PowerMinn 9090, LLC. Fibrowatt, LLC (now owned by the holding company Homeland Renewable Energy) is promoting several incinerators in the U.S., but does not currently own any. Organized community opposition has stopped Fibrowatt's plans in several communities in the U.S. and Europe. Fibrowatt's air emissions have been the subject of controversy. The permit granted for their Fibrominn project allows them to be Minnesota's largest single source of arsenic pollution, their largest source of sulfuric acid air emissions, their 2nd largest source of hydrochloric acid air emissions, and a significant new source of dioxin pollution. Based on air pollution permit data, for several pollutants, Fibrowatt's incinerators would be dirtier than newly-built coal power plants (which we also vigorously oppose). Once in operation, Fibrominn has racked up numerous violations, including having exceeded permit air pollution limits for nitrogen oxide, sulfur dioxide and carbon monoxide. As a result, the state of Minnesota fined them $65,000 and required that they install a new sulfur dioxide monitor at a minimum cost of $80,000. See the state's Stipulation Agreement for more details. Poultry waste is NOT a clean fuel. Biomass is NOT "green" energy. Poultry litter consists of about half chicken or turkey manure and half bedding (wood shavings and sawdust). Fibrowatt's incinerator projects seek to burn about 75% poultry litter plus about 25% "vegetative biomass," which could be anything from crops grown specifically to be burned to crop residue from traditional agriculture to otherwise "non-valuable" wood cut from logging operations in forests. There are other companies besides Fibrowatt seeking to build poultry and other animal waste incinerators. However, Fibrowatt is the big player, seeking to build the largest of them - and the only one in the U.S. seeking to make electricity to be sold as "green" energy to gullible consumers. Fibrowatt tends to come up with new names for each of their projects. Below is a list of existing and proposed poultry litter incinerators. They are targeting communities where there is a concentration of poultry waste production from large poultry agribusiness. They aim to truck in poultry waste from a 50 mile radius, sometimes going as far as 90 miles to obtain their "fuel." Air Emissions Data for three of the Fibrowatt poultry waste incinerators in the UK (Eye, Glanford and Thetford plants) can be found compiled here: Excel format / PDF format for select pollutants. This data was supplied by the Fibrowatt plants to the UK environmental agency. In August 2012, Fibrowatt abandoned their effort to build a facility in the central Shenandoah Valley of Virginia, after it was apparent that the utility wouldn't buy the energy and that there wasn't enough litter to support a large-scale incinerator. In February 2012, Fibrowatt withdrew the second of their three proposals in North Carolina. They gave up their plan for an incinerator in Biscoe, Montgomery County, leaving only their Sampson County, North Carolina proposal, which by late 2012 also seems to have been abandoned. In January 2012, community opposition defeated Fibroandes in Pichidegua, Cachapoal Valley in central Chile. After 18 months of legal actions and mobilizations, involving local authorities and congressists, the regional Environmental Assessment Commission definitively rejected the project, which was proposed by Fibroandes company as the first, to be replicated in Chile and Latin America. In August 2010, after a six-week citizen uprising against Fibrowatt in and around Hart County, Georgia (and in nearby South Carolina), public officials started to come out against Fibrowatt and, once Fibrowatt's attempt to secure a power purchase agreement fell through, they abandoned their attempt to locate in the area. In March/April 2010, the Commissioners of Surry County, North Carolina, the Elkin Chamber of Commerce, the Yadkin Valley Chamber of Commerce and the Yadkin Valley Tourism Authority came out opposed to Fibrowatt's proposed incinerator in their community. The County Commissioners withdrew their millions of dollars of financial support for Fibrowatt. The Yadkin Valley Chamber wrote "The chamber is a pro-business organization, but we do not support any business that would have a negative impact on tourism, our citizens or the environment." On May 16th, 2010, Surry County Commissioners voted unanimously to stop negotiations with Fibrowatt and pursue other businesses for the Elkin site, putting an end to the four-year battle to stop Fibrowatt in the Wilkes and Surry County area. In March 2010, Fibrowatt was kicked out of Page County, Virginia, only a month after a furious public learned that Fibrowatt was meeting with their public officials, when county officials wrote the company to say they're no longer interested. See more at the Page County Citizens website. In 2005, after years of opposition, the Fibroned project in the Netherlands was stopped when the project's permit was rejected for the second time. In 2002, opposition to Fibrowatt's proposed "Fibromiss" incinerator in Magee, MS caused the company to leave town and try locating elsewhere in the county (Mendenhall, MS), where they have been opposed by local residents. 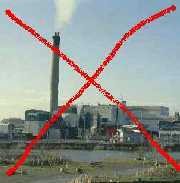 Green Delaware, a grassroots environmental group in Delaware state has led the effort to ban incineration statewide in 2000, forcing Fibrowatt and other poultry waste incinerator promoters to move their plans outside of the state. Carl Strickler, a key player in Fibrowatt's U.S. operation (and Vice-President of the Fibrominn project) was defeated in 1998 when his previous company (Reading Energy) was kicked out of Morrisville, Pennsylvania - a small community outside of Philadelphia - when they tried to build a wood waste incinerator there in 1997. 500,000 tpy turkey litter plus 100-200,000 tpy alfalfa; See Fibrominn permits here (scroll down to Fibrominn); See initial stack tests: 7/4/2007 and 7/6/2007. Pictures available here. For articles, see FibroGeorgia facility profile. Fibrowatt FibroHills Elkin, Surry County (initially targeted Wilkesboro, Wilkes County) North Carolina USA After a four year fight against Fibrowatt's proposal to build in Wilkes or Surry Counties, growing opposition from area residents, including the medical community, resulted in the the withdrawal of financial support from Surry County. Enginuity Energy LLC Steelton (Dauphin County) Pennsylvania USA 10 Plan to burn poultry litter to power the ArcelorMittal Steelton steel mill near public housing was fought by NAACP and defeated in 2010. For articles, see Enginuity Energy facility profile. Fibrowatt Page County Virginia USA Page County Citizens stopped Fibrowatt after a one month campaign in February/March 2010, resulting in Page County Commissioners informing Fibrowatt that they were no longer welcome. Monopower Ltd. Killycarran Biomass Combined Heat and Power Plant Monaghan, Emyvale Ireland 20 In July 2009, the proposal to site a chicken litter and mushroom compost incinerator at Emyvale, Monaghan in Ireland has been rejected by Monaghan County Council and by The Irish Planning Appeals Board (An Bord Pleanala). Background info on the project available in: Evaluation of Environmental Impact Assessment (5/26/2005). ContourGlobal Santa Catarina Brazil 60 The company plans a total of 120 MW of capacity, so there may be two other proposals in addition to the other Brazilian proposals mentioned above. Joseph Mitchells (Letham) Ltd. Letham Scotland 13,000 tons/year of poultry slaughtering byproducts to be burned in pyrolysis/gasification-style incinerator. Permits granted in 2007. Earth Resources Inc. Plant Carl near Carnesville (Franklin County) Georgia USA 20 Initially was to go online mid-2007, but in mid-2010, they still haven't started construction. Using fluidized bed boiler. Original plan to burn poultry litter has changed to include trash or "biomass." See Plant Carl facility profile for articles, reports and permit documents. LandStudies, Inc. & Five Winds International Duncannon Borough, Perry County Pennsylvania USA 10 2007 Article about these consultants scoping out poultry waste incinerator possibility. Fibrowatt's technology being considered.